Giving the Deputy First Minister responsibility for education is meant to send a message that this service is a priority for the new government. So what might we expect in the coming years? "By 2021, we will almost double the availability of free early learning and childcare to 30 hours a week for all 3 and 4 year olds and vulnerable 2 year olds – a policy that will save families over £3,000 per child per year. To deliver this expansion, we will invest an additional £500 million a year by 2021 and create 600 new early learning and childcare centres, with 20,000 more qualified staff." By any standards this is a big and welcome commitment, even over a five year period. The first delivery challenge is budgetary. Is £500m really enough to pay for 600 new centres and 20,000 staff? By my calculations this will barely cover the cost of employing qualified staff at todays pay rates. Then you have the capital and revenue costs of the new buildings, which is difficult to calculate, but will be huge. Perhaps it's a good thing the former finance cabinet secretary is now running education - he will need to do the 'loaves and fishes' miracle with this one! What the manifesto doesn't say is how and who will be delivering this massive expansion. As the UNISON Scotland early years manifesto sets out, this is best delivered as a public service with fairly paid staff. Working with children is not just about the time spent with each child. Workers also have to plan, evaluate, and assess learning and keep detailed records of each child’s progress. There needs to be wider recognition of what these posts involve and adequate funding for the staffing levels and hours of work required to do the job. Schools and closing the attainment gap is the next challenge. There has been some ridicule from opposition parties over John Swinney’s call for some time, given they have been in power for nine years. However, he does at least bring a fresh pair of eyes to the challenge and as UNISON has pointed out in our submission on the Education Bill, the attainment gap is rooted in our unequal society, not simply what happens in schools. The specific proposals in the SNP manifesto have a very Tory/New Labour feel about them - testing, targets, and funding directly to schools bypassing local authorities. Sadly, there is little evidence that these approaches have worked elsewhere and it is noticeable that the advocates of academies and free schools in England are now calling for larger groupings of schools, as large as 25 schools. That looks remarkably like a local educational authority to me! What is sensible is the plan to renew the focus on literacy, numeracy, health and well-being – targeting support on areas with significant areas of deprivation. Investing £750m ‘in the next parliament’ in the Attainment Fund and £100m from the Council Tax changes will be welcome - even if the extra bureaucracy of head teachers having to administer it isn’t. There is also a welcome recognition that teacher numbers are not the only solution – classroom assistants get a mention after years of cuts. School libraries also deserve greater recognition. The biggest structural change is the proposal to create ‘new educational regions to decentralise management and support’. That sounds like tautology to me, but we can only assume it means regionalising education authorities, while allocating more resources directly to schools. This will be backed up by ‘more focused and frequent’ school inspections. The next stage in the education journey is colleges. After years of cuts, regionalisation and 2000 job losses; the commitment is to, ‘maintain the number of full-time equivalent college places that lead to employment’. There is an understandable view in the sector that they have paid the price for extra university funding. However, there should at least be a bit of stability going forward. For universities the focus is on improving access for students from the most deprived backgrounds. Free tuition is the right policy and enjoys cross party support, but it has done little to improve access. They will adopt the recommendations of the Widening Access Commission and set a new target of 20 per cent of students entering university to be from Scotland’s 20 per cent most deprived backgrounds by 2030. Reviewing bursary support for students in colleges and universities will be an important part of achieving that target. It is pretty clear that the new government’s education focus is on early years and schools. Educational inequality starts young, certainly before school age, so that is the right priority. The row over the Named Person scheme is frankly a distraction from more important issues. The big challenges will be financial, particularly in early years where the ambition doesn’t match the budget. In schools there will be significant scepticism that the outlined structural reform will contribute to the solutions, but targeting additional funds where it is most needed, is the right approach. As we will be relying on these Barnett consequentials, we should take a closer interest in what is happening south of the border. Professor Andrew Street at the University of York points out that the claimed £8.4bn increase in English spending by 2020-21 is actually closer to £4.5bn. The chart below shows how this spending might be increased each year and the average 0.8% looks very low. The modest £500m increase promised for NHS Scotland therefore looks like John Swinney’s pragmatic assessment of the Barnet consequentials. On this basis, there appears to be a common understanding of the problems. The challenge remains to deliver the solutions in the context of austerity. Public service reform could be one of the defining issues of the coming Scottish Parliament session. I was speaking at the 'Leading Change in Public Services' conference at Queen Margaret University in Edinburgh today. An international gathering of academics and practitioners on this issue. There is some very interesting academic work being done on this issue across Europe that should inform our debate. My task was to set the scene by outlining public service reform so far in Scotland, likely new directions and some alternative approaches. The challenges is the easy bit to describe. 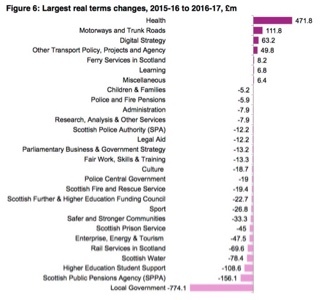 Public services are being savaged by austerity economics, and in Scotland, has largely been dumped on local government services. The chart below demonstrates this in financial terms. The workforce numbers show this even more dramatically. A staggering 87% of the public sector job losses in Scotland since the crash have been in local government. Job losses and finance are the biggest challenges, but not the only ones. We also have demographic change that is increasing demand on council services, particularly social care. Poor economic performance is also increasing demand as is the need for public services to respond to climate change. However, underpinning all this is Scotland's deep seated inequalities. As the Christie Commission highlighted five years ago, failure demand accounts for around 40% of public spending in Scotland. The financial pressures are likely to get worse. There is about another £1.5bn of revenue cuts to come for Scotland in the current UK spending plans. The Scottish Government is not planning to use many of the new powers to take Scotland in a different direction to austerity. The tweaks to the higher rate tax bands and the Council Tax will mitigate the cuts by around £350m less £60m cost of cutting APD, unless as I hope, the opposition parties combine to stop this. 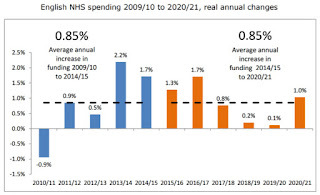 Given the NHS spending commitments, it seems pretty clear that local government (less perhaps education) will continue to bear the brunt of cuts. Apart from job losses, the impact on the workforce can be seen in UNISON Scotland's monthly 'Damage Series' of reports. Almost all staff groups comment on the salami slicing of services, the juggling of plates to the extent that many of them are now crashing. Just doing the statutory minimum, and often not even that, while abandoning much of the preventative work that they value and is so important if we are to tackle long term problems. It shows up in sickness absence, particularly stress and violence, and in a demoralised workforce with declining morale. We should also pay more attention to the ageing workforce and the lack of young people coming into public service. Five years ago I was working on the Christie Commission report. It called for services to be designed from the bottom up with greater user involvement. The report argued for preventative spending and a focus on outcomes. It also called for more integrated working, breaking down the silos and even going as far as looking at the 'one public sector worker' concept. While almost everyone agreed with the principles set out in the report, delivery has been mixed, as I set out in an article last year. While the essential Scottish public service model remains intact, we have greater centralisation, ministerial direction and a new approach of quangos directing policy, even when delivery remains local. In my experience, the longer ministers are in office, the stronger the temptation is to direct services from the centre, reinforced by the civil service culture. The SNP manifesto points to a programme for the new government that envisages significant structural change. Reviews are promised of the structure of health boards and councils. New regional education bodies with more finance going directly to schools. There are also proposals to allow community councils to run some services and 1% of council budgets devoted to community budgeting. This could lead to fewer health boards, which might work for acute services, but not for primary care. Of course they are subject to the new integrated joint boards with social care. If this form of joint working doesn't deliver greater joined up working, then the pressure to make them formal structures and the employer of staff will grow. With education and social work going elsewhere, leisure and housing has already largely gone arms length, you are left with rump local authorities. They could be left to wither on the vine or merged, with decentralisation schemes that give communities a larger say in how the few services that remain are delivered. Structural change is notoriously difficult and expensive. Organisations go into limbo while preparing for it and then spend years sorting out the new bodies. In the current financial climate it could be argued that is simply analogous to shifting the deck chairs on the Titanic. At today's conference I didn't offer a prescription for a different approach, but I did suggest some principles that we might consider in the debate to come. First and foremost, we should not simply roll over and accept austerity economics. Public services play an important role in tackling inequality, in part, as the OECD has observed, by mitigating the gross income inequality in the UK. We should recognise the value of proportionate universalism while targeting resources on preventative spending. While centralisation is not the answer, that doesn't mean that in a small country there isn't a case for national frameworks. These could set out common standards, data sets and proportionate scrutiny. In particular, UNISON has long argued the case for a national workforce framework that would include common staff governance standards, training and start to break down the silos and make it easier for staff to move between services. I am personally increasing attracted to a longer term goal of the one public service worker with common terms and conditions, although I recognise that this has its challenges. Apart from facilitating integration, it would also reducing the significant costs associated with constantly reinventing the HR wheel. Having national frameworks then enables greater localism, freeing up local democracy to focus on integrated service delivery rather than fragmenting services on the outsourced English model. This could be based around real communities; towns and discreet urban areas, with community hubs providing a base for most public service delivery. Services can then be designed with service users and staff, adopting system thinking principles, rather than the dead hand of the one size fits all approach. Austerity may be the defining feature of public service delivery in Scotland, but we shouldn't let it define the sort of Scotland that we want. Public services play a central role in that vision and it is right that we take a considered look at how they are best delivered. Scottish Labour - What Next? As you would expect after last week’s election result, there is no shortage of analysis of Scottish Labour’s problems – even if that commentary is stronger on the problem than the solution. My own contribution can be found in my column in today’s Sunday Mail. I am in not ducking the deep-seated problems, but Labour’s policy stance at this election puts it in a stronger position as austerity bites even harder. Making a radical change of direction or leadership is not the way forward. Sometimes in politics you have to play a longer game. Brian Wilson in the Sunday Times also takes a positive view. If there is any point to John McTernan, it is to articulate another failed strategy - something he has considerable experience of. And he doesn’t let us down with his three points in yesterday’s Scotsman. So let’s address them because they do represent a strand New Labour opinion that believes that Labour must do whatever works, and if that means out Torying the Tories, then so be it. Firstly, Labour should be the fundamentalist unionist party. This strategy may have shifted the voting share a couple of points in this election, but in the longer term it’s a dead end game. With the ‘No’ vote split three ways, Labour has little chance of getting more than a quarter of the vote - forever fighting with the Tories over the dubious prize of being the largest opposition party. It’s fine for the Tories who just want to conserve the status quo, but we are a socialist party, committed to changing our unequal society. Secondly, Labour should not have outflanked the SNP on the left with the taxation policy. In essence this means conniving with the SNP’s Scandamerica myth that we can have social justice without cost. An SNP-lite policy stance would have left Labour without a distinctive policy offer. The polls showed clearly that Labour’s policy was more popular with SNP voters than their own manifesto offer and that points to a longer-term strategy. Thirdly, ‘the unions self-indulgently imposed an anti-Trident policy of Kezia Dugdale’. Factually wrong because the policy was supported by constituencies as well as unions and reflects a long-standing view within Scottish Labour on this issue. Historically, that may have reflected a moral stance on nuclear weapons, but today, just as many members see the folly of spending £167bn on a militarily useless weapons system. An interesting view, from outwith Scotland, comes from PaulMason. His solutions focus primarily on the UK party, but he has some useful points on Scotland as well. Like many English lefties he retains a romantic view of Scottish nationalism and an optimistic view of the prospects for independence. None the less, he has a point about how Jeremy Corbyn needs to get a grip of UK party organisation and reorganise it as a federal party. Politically, this is reflected in the latest Red Paper publication and organisationally, in my own paper. There is already a rather poor UK party discussion paper on this issue and there will shortly be a consultation amongst Scottish Labour Party members. I am not sure Kevin McKenna’s ‘bring it on’ strategy over an independence referendum will work. Even though I was one of the few that supported Wendy Alexander. It was a strategy of its time, like the second question that the unions also championed. It was an opportunity missed, like so many, due to the complacent Labour Westminster establishment of the period. The problem with a quick re-run of Indyref is that neither side has moved on. It would again be Project Fear vs Project Pollyanna, with Project Fear having fresh economic ammunition post the oil price crash, but with even less vision of how a fairer Scotland can be achieved. On the other side, the independence project remains a disparate political alliance, with little work completed on the issues that need to be addressed before a clear majority of Scots will vote for it. In conclusion, I’m afraid I don’t have a magic wand for Scottish Labour’s challenges. However, I do believe that the rebuilding project that started some nine months ago has to continue with renewed effort. Scottish Labour now at least stands for something worthwhile. It will take time to get a hearing, but lurching in a new direction will only hamper progress.